This has quickly become a household favorite! 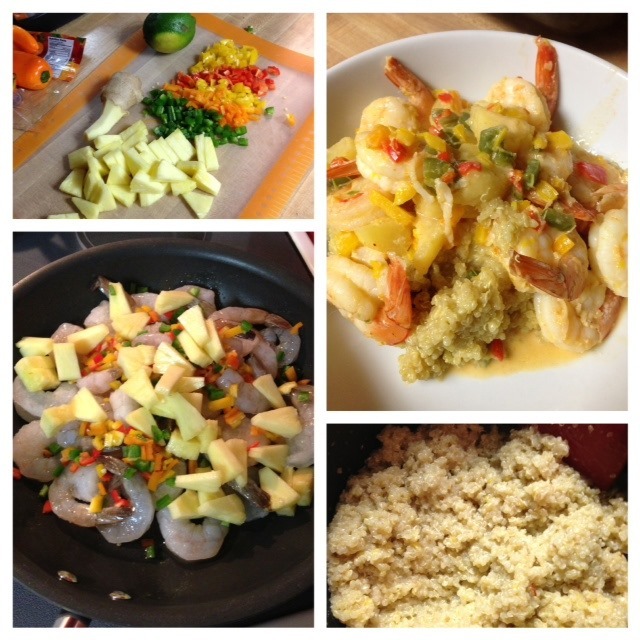 I found a recipe on Pinterest for Pineapple and Shrimp Fried Quinoa, and I planned to make it the same week. However, the more I looked at the recipe the more changes I made to it. I knew my family wouldn’t go for some of the ingredients, and then I just got creative and changed the whole thing. This really is a colorful and fun meal to make in the dead of winter. It really brought some “summer” into our house when I made it. Just a quick note…The first time I made this I only made half of the Coconut Quinoa recipe below. My son inhaled half of the quinoa I made for the meal, and my husband and I ate the rest, which didn’t leave any to go with the leftover shrimp (very little shrimp was left). 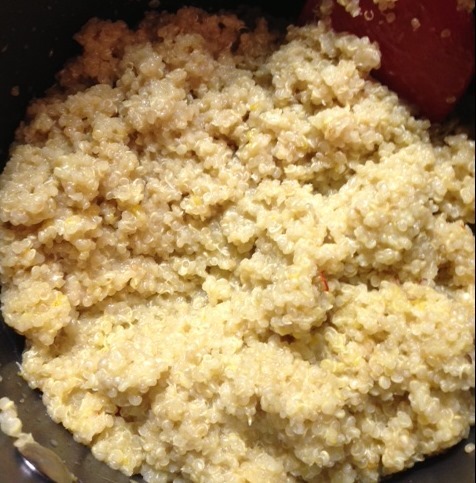 I made another batch of the quinoa the next day and doubled it. It came out perfect! Combine all the ingredients for the quinoa in a pan and bring to a boil. 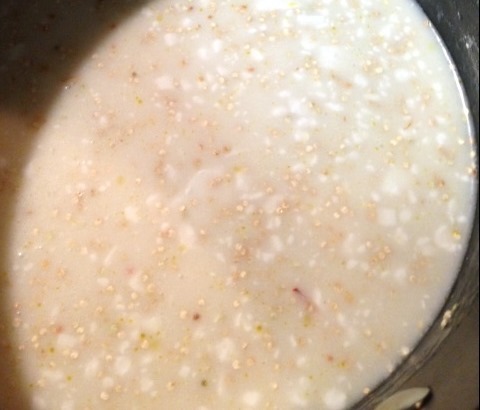 Reduce heat, cover pot, simmer, and cook until liquid is absorbed and quinoa if fluffy. 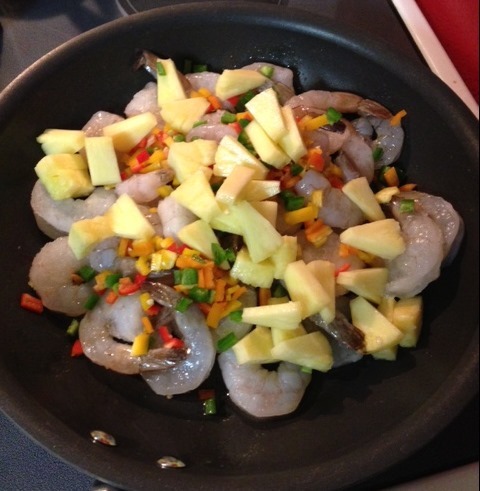 While the quinoa is cooking you can prepare the Hawaiian Pineapple Shrimp. 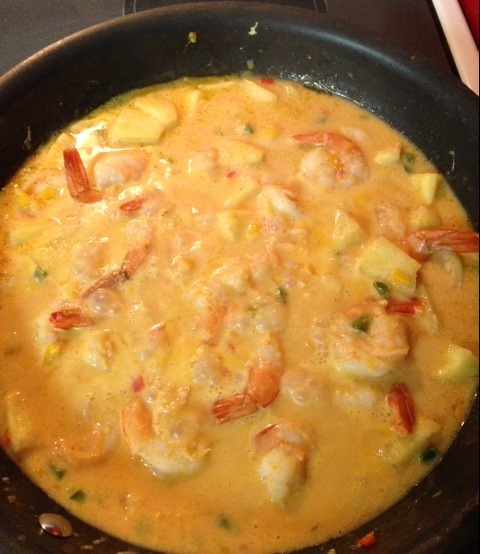 Add all the ingredients except for the coconut milk and curry paste to the pan, and cook over medium heat until shrimp is done. Then, add the coconut milk and curry paste. Stir until curry paste and coconut milk are combined into the sauce. Serve over the Coconut Quinoa. Combine all the ingredients for the quinoa in a pan and bring to a boil. I always leave a half cup of the “thicker” coconut milk for the shrimp dish. Reduce heat, cover pot, simmer, and cook until liquid is absorbed and quinoa if fluffy. 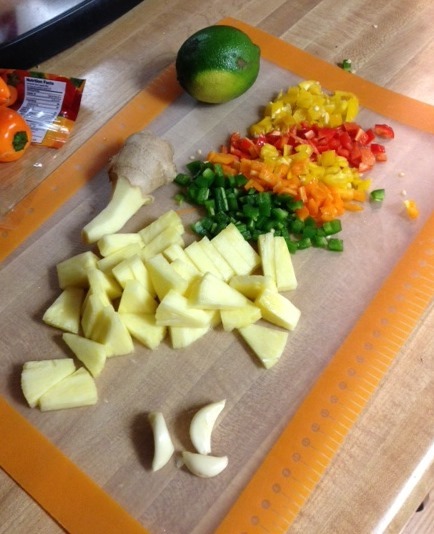 Prepare your pineapple, ginger, mini sweet bell peppers, jalapeno, garlic, and lime juice. 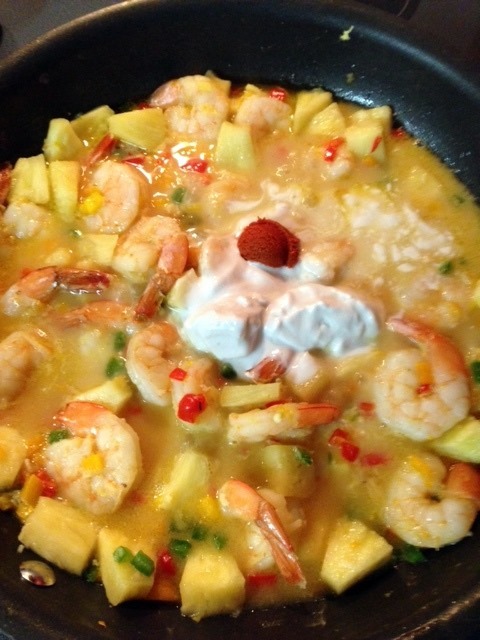 Add all the ingredients except for the coconut milk and curry paste to the pan, and cook over medium heat until shrimp is done. Then, add the coconut milk and curry paste. 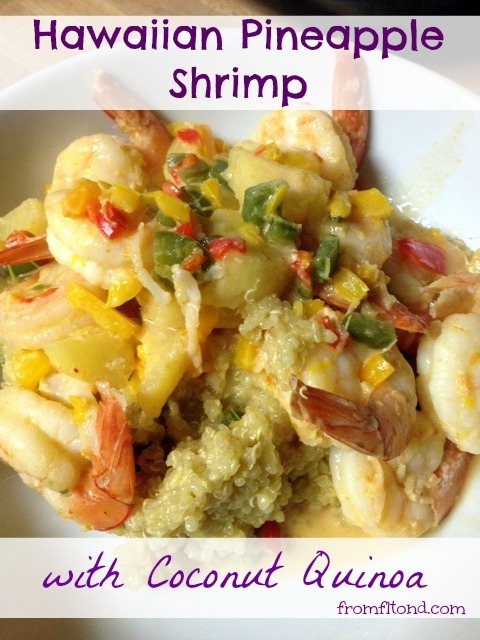 This entry was posted in Dinner, Recipes and tagged coconut quinoa, coconut shrimp, hawaiian pineapple shrimp, quinoa recipe, recipe, shrimp recipe on March 4, 2013 by fromfltond. That looks so good! Pinning this one for sure! I eat the Coconut Quinoa for breakfast too. I love it! Thank you 🙂 It is a new favorite of mine!